As the railroads were laid across the midwest, Chicago and Detroit were key centers of commerce and manufacturing. Nearly every railroad ran lines to the great cities – and many of those lines ran around the south shores of Lake Michigan. In 1906, the enterprising chairman of United States Steel, Judge Elbert H. Gary, noticed this, as well as the easy access to the lake for more transport options. He purchased 12,000 acres and built a $100,000 plant to produce steel. Since most of the land around the plant lay undeveloped – and he needed workers for his plant – he and US Steel planned a city just outside the gates of the mill. Gary, Indiana was born. 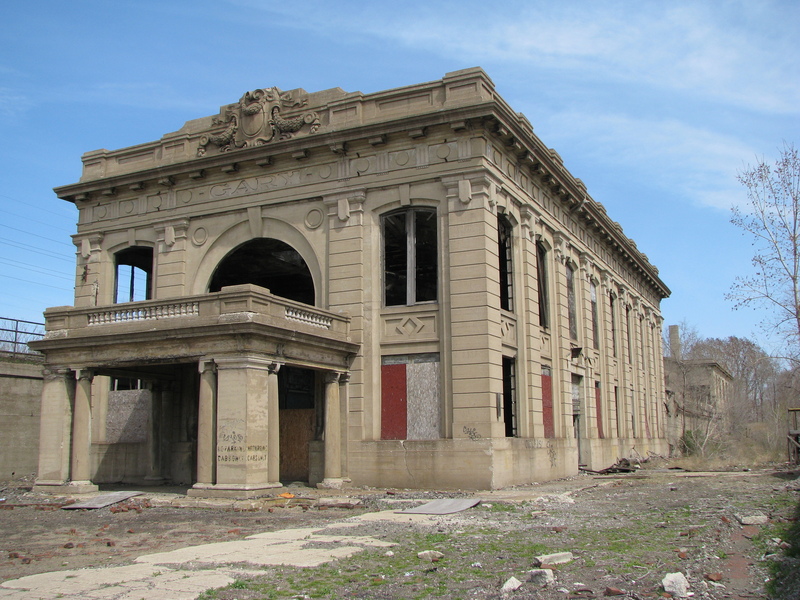 To support the thousands of workers moving in from around the country, the city immediately needed a new passenger and freight rail station. 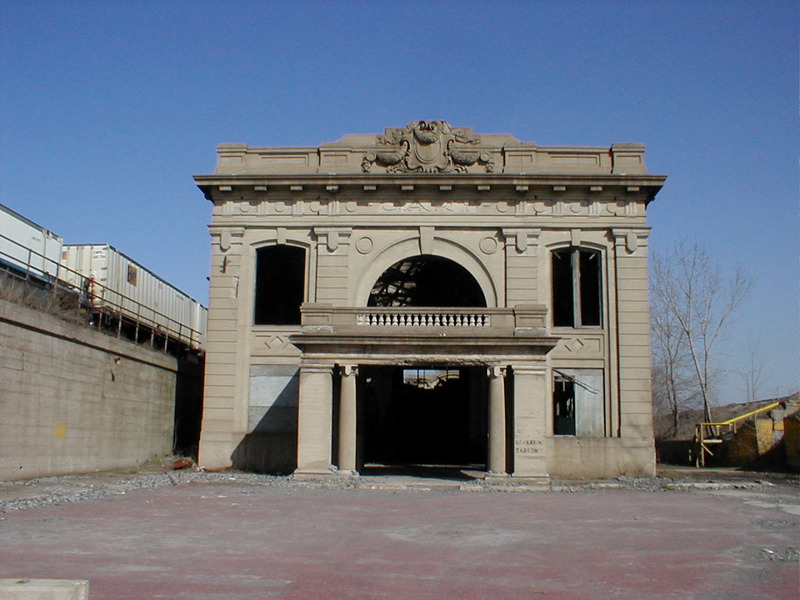 Architect M. A. Lang designed and built a two-level station between the Baltimore and Ohio (B&O) rail line and the South Shore & Michigan Southern line (part of the New York Central System). He borrowed the neoclassical design popularized by the World’s Columbian Exposition in Chicago 15 years earlier and created a simple, yet elegant station befitting the city growing around it. Steel reinforced concrete made up most of the construction – supported by the steel companies as a way to sell extra steel. The method was revolutionary then, but today nearly every public building and skyscraper uses the same construction technique. This is probably why the building still stands today, as it has actually gone unused for half a decade – since the highways that eclipsed the need for passenger terminals by the 1950s. 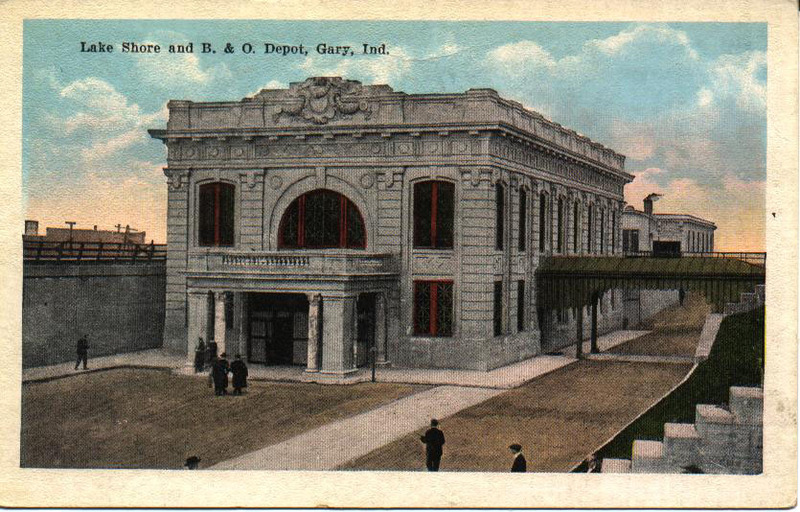 This postcard shows the station during its prime. Note the red brick road that runs up the hill past the freight terminal – wagons holding goods would use this road (still there) to bring packages to the upper level terminal for shipment by rail. The entrance to the building faces west toward Broadway. It sits nestled between raised rail lines, which means the station is actually hidden until you are almost right next to it. Not a single window is still intact – all broken by vandals decades ago. The only sign still visible inside or outside the building is a painted notice on the front pillar that says “No Parking Cabs Only”. The outside of the building is in astonishingly good condition for a building that has gone unused for 50 years – a testament to the quality construction. There are no barriers to the front drive nor to an old red brick road that runs up the hill along the south side of the building. The building is alongside the rail line that runs along its north edge, and a red brick road separates it from the line that runs along its south side. The massive main hall, looking from the front doorway. The glass skylights are gone, as are all of the windows and doors. Once inside, there is a large, open room that vaults two stories to the roof. 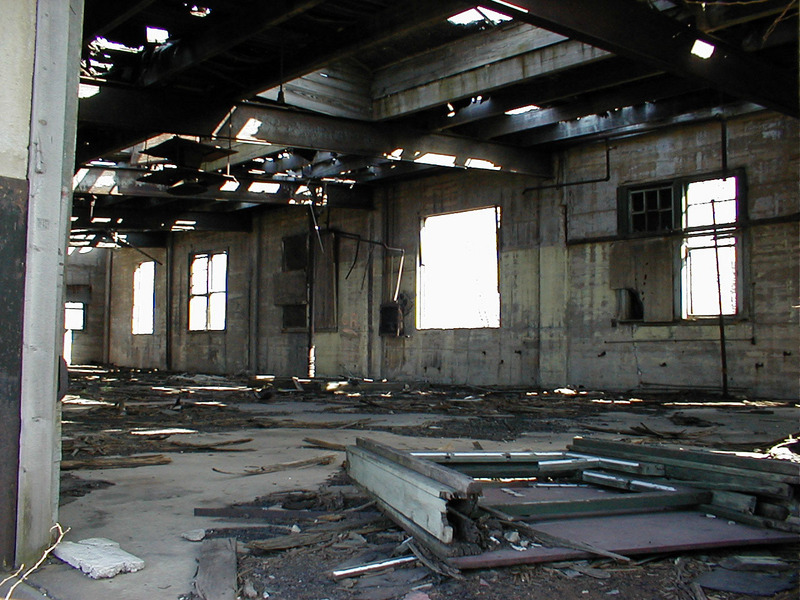 Much less sturdy material makes up the roof – parts of the rusted the steel supports litter the floor. There is a staircase at the rear of the room that leads up to the rear loading platform – this staircase, also of steel, is completely unsafe to climb. The building protrudes from a hill, so while the front is two stories high, the rear exits only on the second story. Very little exists inside that would lead you to guess this was a railroad station – no signs, no counters, nothing but some rotting debris. There are also no real rooms in the building – everything is open into this central area. 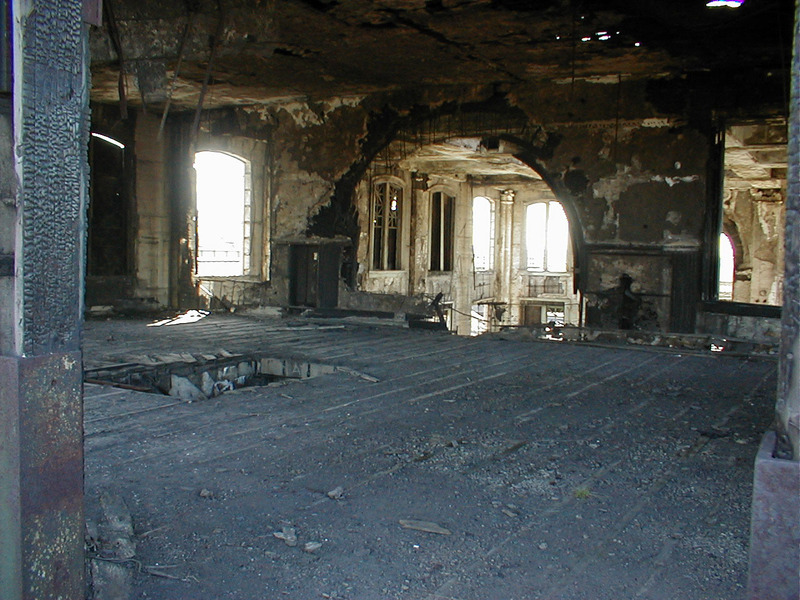 There is evidence of a fire in the northeast corner of the building that continued up through the second level – there is some ash and black scorched concrete on the walls and ceiling. However, since the walls 100% concrete and steel, this fire had little effect except to weaken the 2nd story platform. According to several historical reports, an auto parts salvage business used the building for a time, though no evidence of this easily found. There is a doorway on the south side of the building that leads across the cobblestone road to a concrete staircase built into the south track support structure. The north door actually tunnels under the north tracks to a staircase that leads up to a platform on the opposite side of the north tracks from the station itself. Thus, if one wanted to board a train on the south tracks, you would cross a road and climb a staircase to reach it. To board a train on the north side tracks, you would walk through a tunnel under those tracks and up a staircase to emerge on the other side. Period pictures show an ornate metal awning that covered the south-side walk and staircase to the platform. The North wall of the main hall, with the door to the tunnel leading under the north-side tracks. 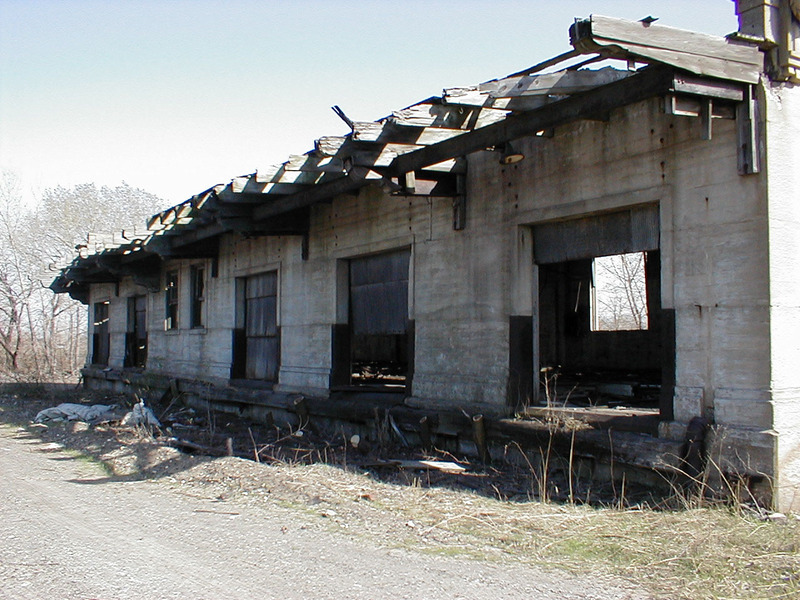 The South side of the building with the doorway and walk that leads to the south-side tracks. 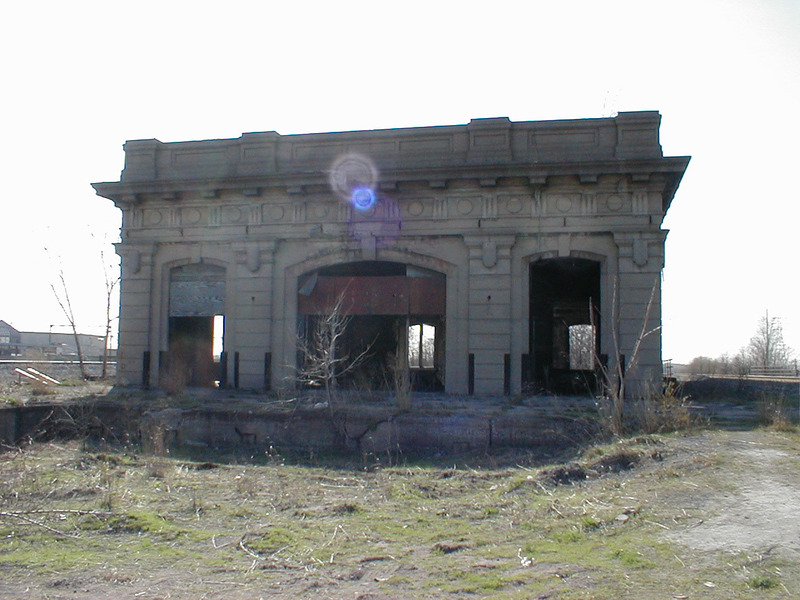 The express freight building is visible in the distance, as well as the remains of the red brick road. The East end of the main building. The overgrown upper platform is on the left, and the express freight building behind the photographer. Looking inside the main building from the East portals. There is fire damage here to the wood framing and floor – not safe to walk on. The North side of the express freight terminal has a series of loading dock doors. The red brick road comes up the south side of the building, curves around the east side, and then turns again to the west to completely cover the area around the express terminal. The building’s basement appears filled with some some large equipment – perhaps a boiler – but there was no visible way to enter this area safely. The West end of the express freight building. The platform that joins it with the main terminal is on the right. The loading docks on the North end of the express freight building. It is possible that a spur line was once here, as track ballast litters the ground. 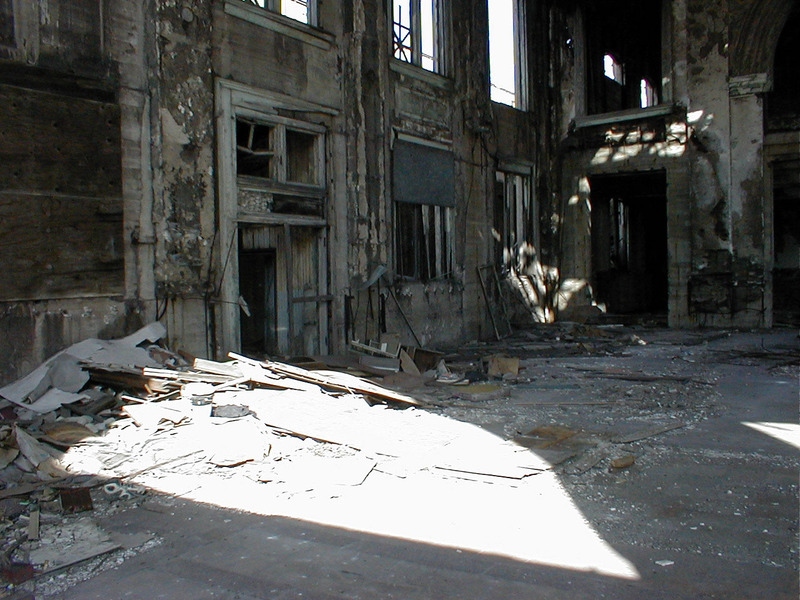 The inside of the express freight building. Several plans are in the works to reuse the facility. An ambitious project called the Midwest Rail Initiative designates one of the adjacent tracks for a high-speed rail service between Detroit, St. Louis, Chicago and Indianapolis. The station’s strip of land connects to the Indiana Dunes National Lakeshore to the East, and some plans have call for the station to serve as visitor center and gateway to the park. However, plans to reuse the facility have been in the works for five decades, and time is ticking away. 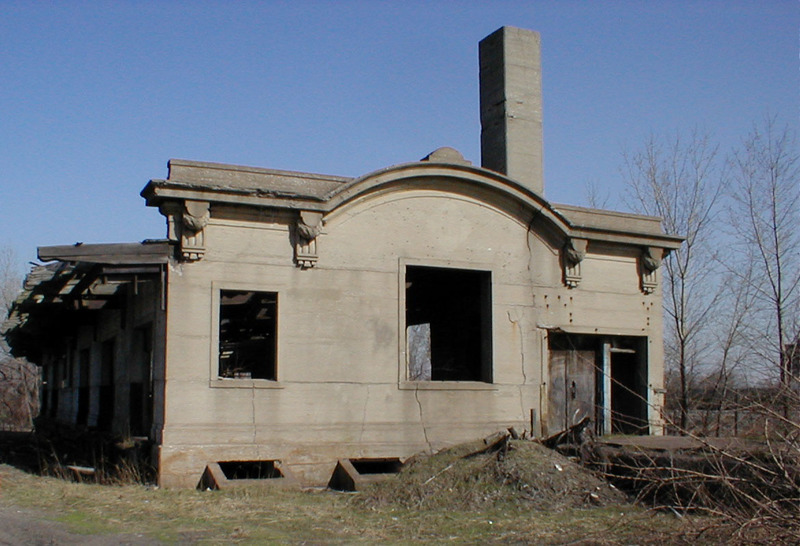 The station has earned a spot on the Indiana Historic Landmarks Foundation Top 10 Most Endangered list, as well as the National Historic Landmarks Top 10 list, and the Great American Station Foundation’s Top 10 list. 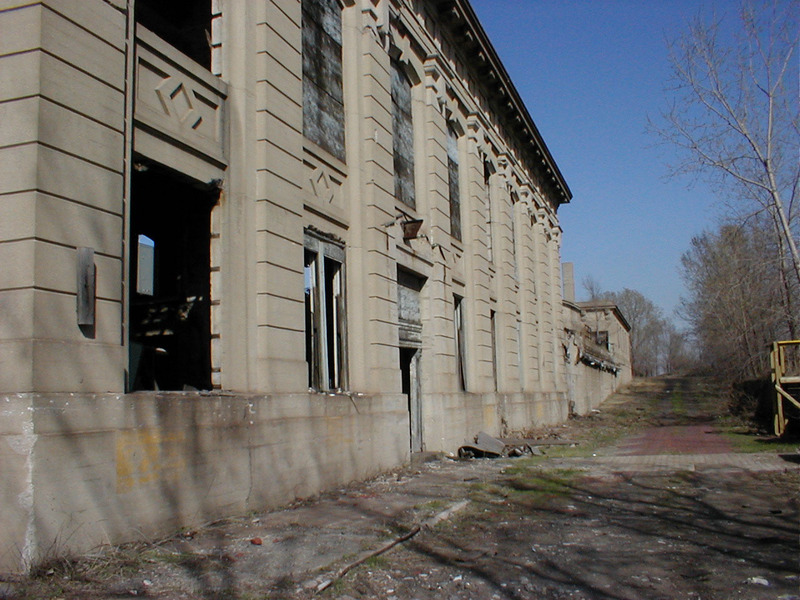 The city applied for $725,000 of federal money in December, 2000 to stabilize the station and begin the process of redevelopment. With luck, this attention will move Gary Union Station from Indiana’s “lost” to Indiana’s “found”. Not so much of an update, though, because absolutely nothing has happened (other than further decay) in 8 years as of April, 2009. This looked like it was at one time a nice looking building. It’s a shame it’s just been wasting away. Nice write up. I see the building from 90 and I always wondered what it was used for. Thanks for posting the info and pic’s. I do hope something good will come of it. Hey, great post. I visited the Union Station recently and was searching for some more insight about this building and I came across your page. I posted some pictures I took the other day into my blog – even though it’s written in German, you might “enjoy” the photos. 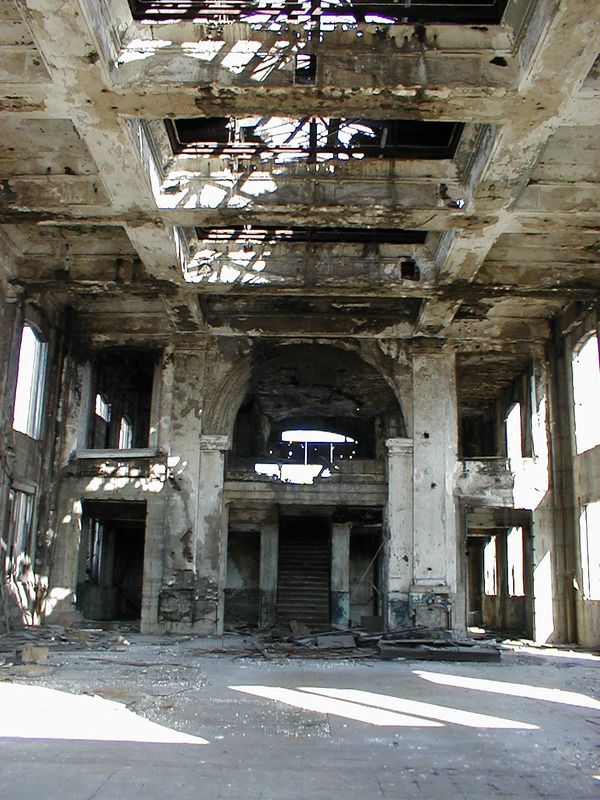 We are going to be visiting Indiana and are a bit fascinated with these abandon buildings. We are two girls from Utah and have read that Gary may not be the best / safest place to hang out for the day. Would it be safe for us to visit the train station, theater and or hotels abandoned in this area? I was born in Gary in the 60’s when it was still somewhat safe to go downtown. If I were you I wouldn’t go into downtown Gary if it’s just two of you. I was just reading this morning there have already been 19 murders in 2015 in Gary. It’s simply not safe. It is usually at the top or close to the top of the list of most murders in the nation. I am certain none of these places are structurally safe either. If you feel the need to go I would just drive by them and continue on. You read correctly Dawn, not the best place to “hang out” for the day. If you are that die hard to see these places you should go with a larger group of people, not just “2 girls”. It is also unsafe to enter these buildings due to the severe deteriorated conditions plus the possibility of the local police removing you from the area. And NEVER hang out after sunset. Good Luck. My grandfather Jackson worked here when he was a young man!!! Union Station is featured in the 1996 movie “original gangsters” with Jim Brown and so many other buildings on Broadway.Gary is in bad shape but small strides are being made to revitalize the area…..it’s rough.I live in lake station aka east Gary and it has always always has been in shambles..I saw the comment about the 2 girls wanting to wander around Downtown Gary???? NO. I repeat…..NoNoNo! Do not go site seeing in Gary IN lol. Was just there yesterday. While the exterior is still in good shape, the interior , well, basically i’ts just a shell. Anything that was not concrete has collapsed. If there is a plan to re-purpose the interior demolition has already been accomplished. Did not enter the station, not trusting the structural integrity, and did not check out the freight house, due to overgrowth and not trusting leaving my car out of my sight, but am sure they have suffered similarly. P. S. – right around the corner in Gateway Park is steam loco EJ&E 765 on display. All this within a stones throw of city hall.